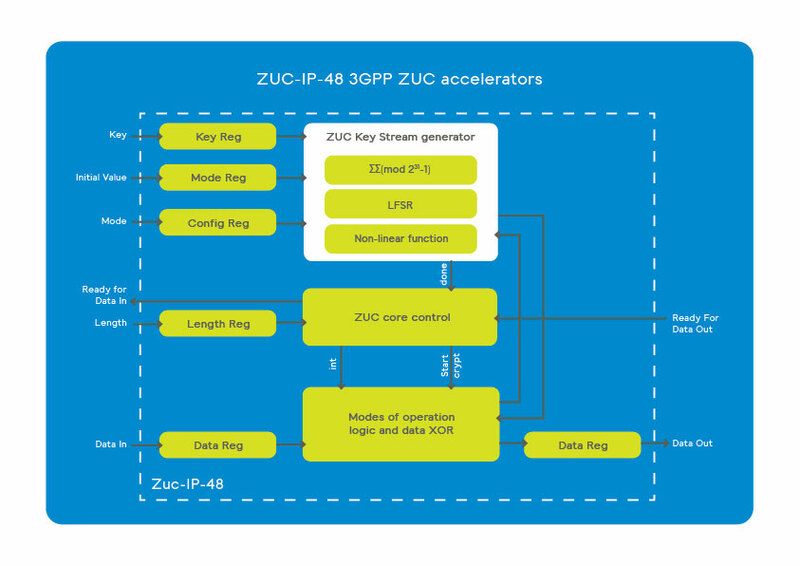 The ZUC-IP-48 cipher accelerators implement the specification of the 3GPP Confidentiality and Integrity Algorithms as specified by 3GPP and ETSI. Designed for fast integration, low gate count and full transforms, the ZUC-IP-48accelerator provides a reliable and cost-effective embedded IP solution that is easy to integrate into high speed SoCs for base stations or other equipment requiring 3GPP support. 3GPP ZUC-48 family of accelerators. The ZUC-IP-48 is a family of the cryptographic library elements in Inside Secure’s HW IP library. For example, the ZUC-IP-48 is the cipher core embedded in some PacketEngine-IP-97/98/197 protocol aware security engines. The accelerators include I/O registers, encryption and decryption cores, and the logic for feedback modes and key scheduling. Inside Secure also offers accelerators for the other 3GPP algorithms. Wide bus interface (32 bit data, 128 bit keys) or 32 bit register interface. Supported modes: 128-EEA3 and 128-EIA3. Low Speed, High Speed versions.